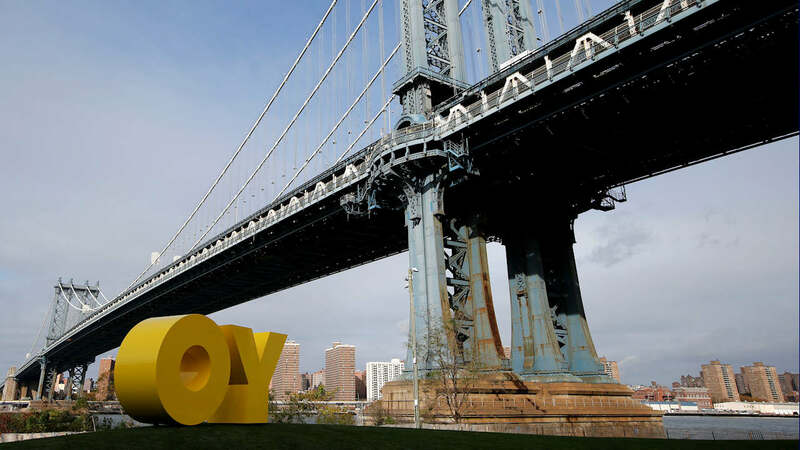 NEW YORK -- A bright yellow monumental sculpture installed near the East River spells "YO" when viewed from Manhattan and "OY" from Brooklyn. Reminiscent of Robert Indiana's LOVE sculpture, the playful aluminum work is the creation of artist Deborah Kass. It went up this week in Brooklyn Bridge Park's Main Street Lawn. Kass also finds inspiration in Andy Warhol, Frank Stella and other artists. She first created "OY" as a spoof on Ed Ruscha's word painting "OOF". Depending on where you stand, the sculpture references the popular Yiddish expression "OY" and the colloquial greeting "YO." The sculpture was commissioned by Brooklyn developer Two Trees Management Company. It will remain in the park through August 2016.